First, horse owning is a choice. Many would argue it is a luxury. Others counter by saying the inspiration, the companionship, the sense of awe in owning a horse is far more economical than years on the analyst's couch. I spent many afternoons as a child coloring horses with my Crayolas. For those like me, becoming a horse owner is the fulfillment of many wistful childhood longings. Since you are here, I imagine you still have those dreams or are ready to live them. Perhaps now you have a child that is horse crazy too. Perhaps you have been lucky enough to have had horses all your life and you are still hooked. So if you want a horse, you now have another choice to make: What kind of horse? My choice was the Morgan Horse. It was a marvelous choice. The Morgan is America's first breed, complete with a romantic tale of Americana regarding it's origins. Sensible, tough, stylish, versatile, beautiful, this breed helped shape this country, and it's virtues are as valuable now as they were in colonial times. Figure came to be known as Justin Morgan, or the Morgan horse, as was the fashion of that day. He was celebrated as a tireless worker. Figure labored day in and day out. His clean legged, well muscled frame was well suited for the grueling labors of pioneer life. In contests, he could out-pull the local draft horses. He assumed each task cheerfully, and this was important: settlers appreciated, beyond his physical prowess, his quiet, "can do" attitude. He was the proverbial Little Engine That Could. 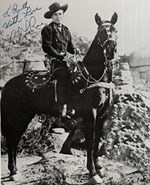 The pluck, the intelligence and the tenacity of the Morgan horse later made him a popular mount for the Civil War, the Calvery, the Pony Express and the Stagecoach teams. 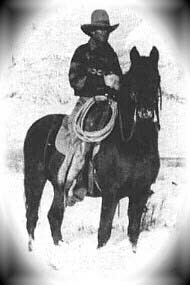 The soul survivor of the battle of Little Bighorn, a horse named Comanche, was of Morgan decent. But we are getting ahead of ourselves. Let us return to the discussion of Figure himself. It takes more than utility to inspire the hearts of men. It takes style, speed, flash. Think of present day people and their cars. 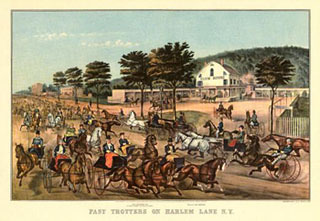 In prior centuries, trotting into town on a good horse was like driving onto Main St. in your Porsche, Lexus or Hummer. Style Figure had in spades. He had a bright, airy way of going, classy but smooth gaits that ate up the long miles of frontier roads. He was handsomely made, with a finely carved head, big liquid eyes and an abundance of thick mane and tail. And he was fast. 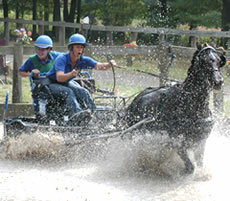 Matched against the best trotters of his day, he won handily and consistently. One major win was in a match race against the best horses New York had to offer, Sweepstakes and Silvertail. Doubtless Figure became the subject of many an admiring discussion over a pint of ale at the local public house. Recognizing his pizzazz, President James Monroe rode Figure as a parade mount in 1817. Figure was a local phenomenon. This charming tale about a popular New England horse would easily have faded into history, except for Figure's most remarkable feature: His prepotency. Bred to any kind of mare, his foals were sure to resemble the sire, resemble him in beauty, in temperment, in strength. This genetic power is rare. Figure became a stallion in demand. His sons and daughters, his grand get and great grand get, they had a look to them, an esprit. They were economical but fancy. They could take the rigors of the battlefield or the farm field. They could look awesome under a General and peerless in harness, or quietly carry children to school. Their value was also enduring. Figure himself lived into his 30's and died, not of the deterioration of old age, but of a untreated kick wound. Morgans to this day are celebrated for this longevity. Though Figure was gone, horses of his lineage continued to be sought after. Different morgan horse lines were crossed together to intensify Figure's excellent traits. As the years passed, these Morgan horses produced the fastest trotters of their day, including Black Hawk (whose sihlouette still graces modern weathervanes) and his son, Ethan Allen, a world champion trotter. Currier and Ives prints captured the look and popularity of these morgans in the cities of the 19th century. 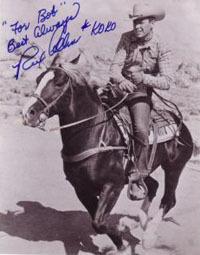 Morgans also went out west to become valuable ranch horses and remount sires for the calvalry. Their blood was used to add potent stamina and beauty in the foundation of other american breeds like the Quarter Horse, the Saddlebred and the Standardbred. Morgans were widely recognized as a breed that could do it all. The advent of the automobile around the turn of the 20th century caused a faltering demand for the all-purpose, all-terrain equine family vehicle, the role that the Morgan so excelled at. Already the blending of good Morgan horses into other, more specialized breeds in the late 1800's had diminished of the stock. The Morgan might have been lost. Fortunately, some breeders of vision remained. In 1905, undoubtably with the slick persuasion of some well-placed Morgan fanciers, the United States Congress established the Government Morgan Horse farm. Yes, our federal government went into the horse breeding business. The chief purpose of the farm was to preserve and improve the breed for modern times. 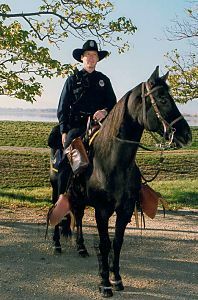 To my knowledge, only the Morgan horse breed has ever somehow had the political clout to get such an amazing commitment of tax dollars. The farm was transferred to the authority of the University of Vermont in 1951. In the mean time, good, albeit less celebrated breeders out west preserved the true working morgan. Purists, devotees of the ancient type, continued to breed the original style morgan in small pockets around the country. The breed's incredible appeal helped it weather these lean times. 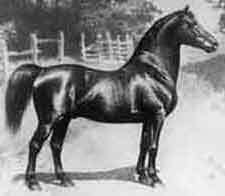 For the 20th century the Morgan horse, like all present breeds, adapted to primarily being a pleasure mount. The pretty, versatile morgan found fans in park classes and western pleasure alike. The Morgan glamour and dependability was not lost on early Hollywood movie moguls either. 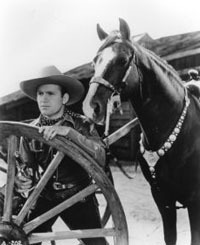 Rex, King of the Wild horses, was a silent film star played by the black Morgan stallion Casey Jones. He was so popular he often got second billing on the play list, before the majority of human stars. 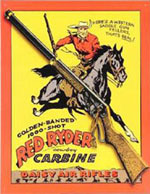 Later many cowboys of the silver screen, from Tom Mix to Lash La Rue, Gene Autry, Guy Williams (the famed "Zorro"),Rex Allen and Wild Bill Elliot (of the classic Red Ryder movies) were mounted on eye-catching morgans. Steve Reeves, a former Mr Universe and then star of Hercules and The Thief of Bagdhad, became a morgan fan while thumbing through Mario Lanza's livestock magazines on an italian movie set. He soon became a morgan rancher in his spare time. Today, morgans continue to attract the rich and famous, like new morgan owners Johhny Depp and George Formann. But underneath all the glitz and glitter remains the incredible Morgan work ethic. Morgans have become outstanding performers at competitive driving, often winning in Europe over seasoned continental and english champions. They are gaining poplularity in dressage and sport horse pursuits, being lighter and more nimble (and dare I say sharper?) than the warmblood competitors. Morgans are favored by police mounted patrols; the Morgan temperment shines in their calm handling of crowd control. On a much smaller scale, the federal government is still in the business of breeding morgans - at the Morgan Horse Farm in Point Reyes National Seashore, where they produce mounts for federal park rangers. Morgans continue to work as reliable stock horses and they are becoming a force in competitive in reining. 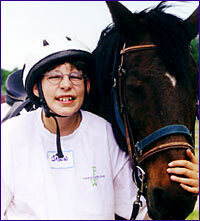 Perhaps most endearing, Morgans find a welcome niche in equine assisted therapy programs where their sweet demeanor and love of people open up new vistas for handicapped riders. So why get a Morgan? 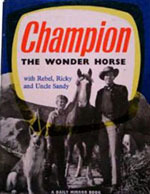 I argue that the old Hollywood hype for Gene Autry's horse Champion wasn't all that far off: there really is something of a "Wonder Horse" in this breed. A Morgan can do just about anything you want it to do. At very least a Morgan will try it's heart out for you. Morgans are as ideal for the modern day pleasure rider as they were for the gritty souls that pioneered this country. Who now-a-days isn't captivated by beauty and style? Who isn't interested in sturdiness and economy? The vast majority of horse owners today want a horse that is safe for the family, that is sound of mind and body, that is adaptable, that is fun, that is breathtaking, that is, in short, truely a pleasure to own. That, my freinds, is the Morgan resume. There are a lot of breeds out there with some specific outstanding traits to reccomend them. But if you are looking for the great, all-around horse, a horse that is easy to love and easy to own, to me the question is not why get a Morgan, but rather, why get anything else?